It’s almost Halloween and you can expect people to throw a costume together last minute. 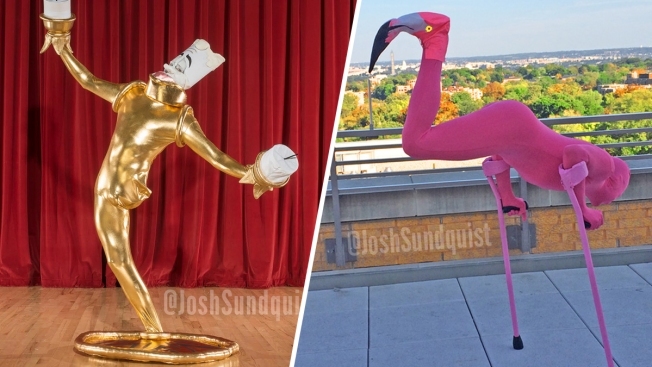 The same can’t be said for Josh Sundquist, who says he is always thinking about what he’ll wear for the spooky holiday. The 33-year-old Virginia native, who lost his leg to a rare form of bone cancer when he was 9 years old, said he's been dressing up consistently for Halloween since college. The costumes over the years have included Lumiere from “Beauty and the Beast,” a flamingo, an IHOP sign and a Dairy Queen "Blizzard." On Thursday, he revealed on Instagram his latest costume, the popular “Winnie the Pooh” character Tigger, which someone on Reddit suggested he dress up as. The motivational speaker, bestselling author and Paralympic athlete — he competed for the U.S. Paralympic Ski Team in 2006 — loves Halloween. Growing up, he lived in a very conservative and religious household and said his family used to turn off the lights in their home so trick-or-treaters wouldn’t bother them. Sundquist, who now lives in California, chooses to make fun out of his situation. He said he’s heard from other amputees, who said he’s inspired them. “It gives me an opportunity to dress as something I am not, but to use what I am in a creative and unexpected way.” he said.